Oh, I'm so happy. I just got the newest member of the family! 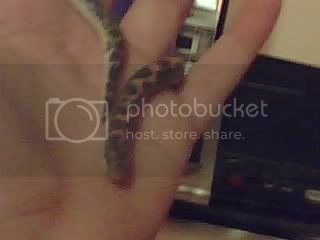 It's an unnamed Sand Boa that I got from PetSmart. It's so pretty and cute and friendly. Anyone have any androgynous name ideas? Capo, the Pixie-Bob, is my baby. 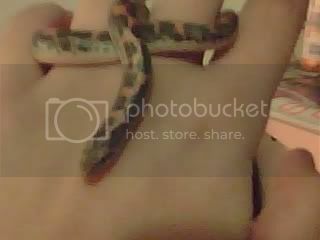 And so is Concord, the Sand Boa. May they both live long, healthy lives. I finally found a name for the little one. For some reason, Concord stuck in my mind. (yanno, like concord grapes) I can finally call it by a name and not just 'snake', which was getting old and made me feel like he wasn't part of the family.